Making vegetable stock often seems like more trouble than it’s worth. Yet the store-bought stocks tend to be too bland or too salty. (In How to Cook Everything Vegetarian, Mark Bittman laments that he wanted to “include an appraisal of store-bought vegetable stocks, but … none is consistently good enough to recommend.”) So in cooking for The Professor, I’ve sometimes fallen off the vegetarian wagon and succumbed to low-sodium chicken stock. But I’m determined to find an alternative. So consider this the first post in an ongoing exploration. Some experiments will be needed. And ultimately some taste testers. 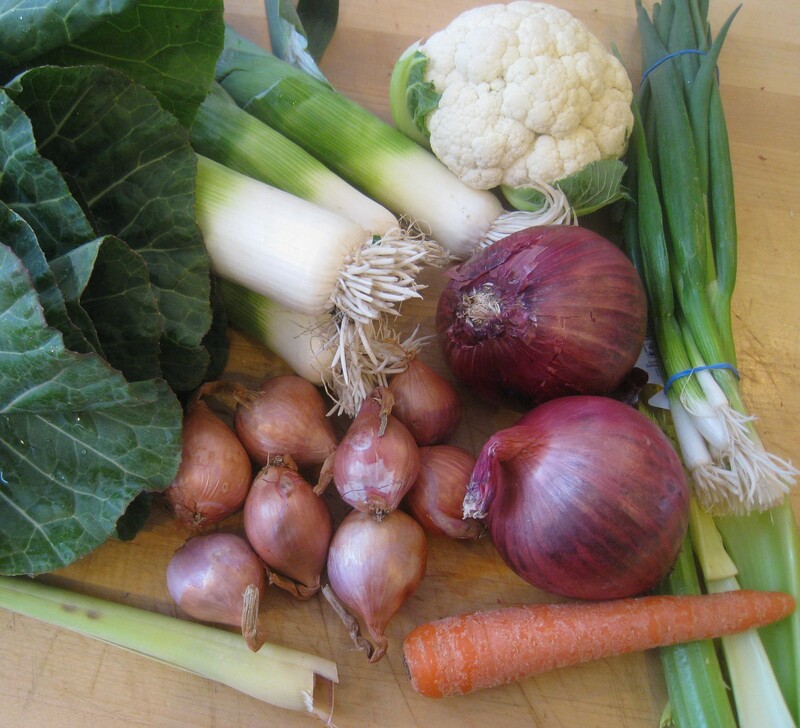 For the moment, I’m starting with a recipe for “The Ultimate Vegetable Stock” from the team of cooks and testers at Cooks Illustrated magazine and the PBS television show, America’s Test Kitchen. They set out to create “a nicely balanced, robust vegetable stock recipe that vegetarians and non-vegetarians alike would consider making” — a goal that lines up nicely with the focus of this blog. The Cooks Illustrated team doesn’t just throw a few onions and celery stalks into a pot with water and let it simmer. The recipe calls for lots of ingredients — which you can see below, including some surprises like lemon grass, cauliflower, collard greens — and involves several steps. It also involves more prep work than many stock recipes, as The Professor pointed out. “Thanks,” I said, ignoring the advice as I continued slicing. Though I wondered if the Barefoot Contessa had it right. Would the recipe’s extra ingredients and additional steps be worth it? I’ll find out soon.